Perpetual plaque with 3 plate combinations and a solid American walnut frame with gold trim on a black velour background. Individually boxed. PRICING INCLUDES ENGRAVING on header plate! Solid American walnut frame with a furniture finish, tan velour background and 12 individual plates. An Excellent Monthly Perpetual Plaque. Individually boxed. PRICING INCLUDES ENGRAVING on header plate! Solid American walnut frame plaque with furniture finish and a Florentine plate with black textured center maroon velour background. Individually boxed. PRICING INCLUDES ENGRAVING ! Solid American walnut frame with furniture finish and an antique bronze finish frame casting on black or maroon velour background. Individually boxed. Solid American walnut frame with a furniture finish and an antique bronze finish casting on black velour background. Individually boxed. Solid American walnut frame with a furniture finish and an antique bronze finish casting on choice of black or maroon velour backgrounds.Individually boxed. Solid American walnut framed plaque with gold trim, black velour background. Individually boxed. Solid American walnut plaque with notched corners textured black brass plate with black Florentine border. Individually boxed. 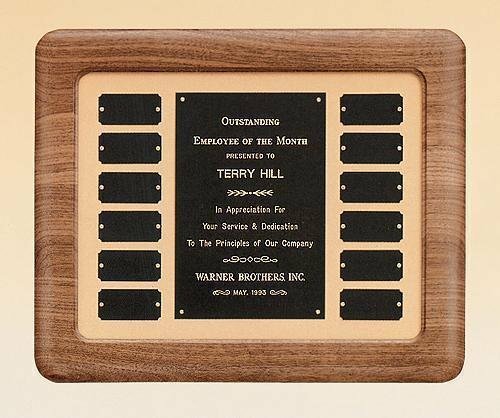 Solid American walnut ornate perpetual plaque with 12 or 24 brushed gold aluminum plate combinations. Custom multi-plate plaques available. Call for quote information. Solid American walnut ornate perpetual plaque with 40 black brass plates.